How would increasing the volume of an 105/2 enclosure affect the lower frequency of the system? Would it help the woofer reach its free air resonance frequency? Or is the woofer "electronically locked" at 40Hz by the big caps at the entry of the filters. Per exemple the the B300 is rated at 23Hz (plus or minus 5Hz) while the 105/2 system rolls off at around 38Hz. Any design ideas we can use to make an improved 105/2? Larger cabinet? Taller? Deeper? More bracing? Better shape to avoid standing waves? And another out loud thought or 2 ... starting with: is the B-300 suited to a TL (or variant) design? Getting deeper and tighter bass from the 105 II seems to be an often expressed wish of contributors and owners posting to other threads. Personally, I would never modify a properly working pair of original 105 II's. They are wonderful just as designed. But as a hobbyist I can't contain my curiosity as to how different bass loading would / could be done either with the B-300 or a B-139 or even a B-200. TL, Isobaric, Reflex ???? Anyone? I have 4 B300 from the constructor series, several different B200 variants in numbers and more B139 than I care to use. Let alone PRs. And a workshop to build some test enclosures. My first project will be just that. Build a test enclosure of about 150lt, and mount a B300 or 2 B300s back to back and in isobaric. I am planning to work with different enclosure volumes by placing 1.5lt bottles filled with sand inside. I have a pair of CS1 like satelites, so I can easily test drive a single enclosure with listening tests. Personally, I would never modify a properly working pair of original 105 II's. I am with you on that. Which is why one set will stay as original as it left the factory, while the second set (the Franken Kef) will be the subject of an experiment. I am leaning toward a 4th order band pass enclosure. Same principle as the 107 and 104 (even though they are also Isobaric, having twin bass drivers). This way, the main enclosure stays a sealed one (as in any original 105), but the baffling allows for a selection of the frequencies. Putting the B300 flat horizontal also means I won't have to turn it 120 degrees every year. Don't get me wrong. The set I am listening to at the moment is very, very nicely balanced and rewarding. It is flat as Utah's Salt Lakes. But I am still looking for that hit in the chest from Dead Can Dance's timpanis or from a low organ key. Currently working on this: B300, B110 and T33 without the plastic fascia. For now, it remains a sealed enclosure but with 50% more volume than a stock 105. Mega bracing and extra thick wall for best stiffness. Except for the top and bottom, there's no parallel facing walls. KEF made their own drivers, so box and driver were pretty well optimised for each other in each design. If you increase the box volume you're making it easier to run out of driver excursion with less amplifier power. The spl at any given frequency is limited by the volume dispacement capability of the driver's moving parts. If you want lower, louder bass you will need more box volume and more drivers. You have to pump a lot of air from a big resevoir. Just look at a Tuba player compared to a trumpet player. If you're unhappy with the sound or quality of the bass you'll most likely have to look at the room construction and acoustics. Hmm... I guess I will stick with the maximum "allowed" internal volume which is 75 litres. Thanks for the advice. On the other hand, the low frequency alignment of most designs is quite tolerant of changes in box volume up to 20% or so. KEF would often go for the slightly smaller option for aesthetic reasons. I designed the B300 SP1060 for the original 105. I seem to recall that ideally the box volume should have theoretically been 80 to 90 litres. However, using 70 or 75 litres made very little difference but was a lot more acceptable domestically. Remember that changes to box and port resonance frequencies are proportional to the square root of any changes in volume. If in doubt, use a simulator to check it out before you build. BTW, I really like the look of your rounded cabs. Go for it! I seem to recall that ideally the box volume should have theoretically been 80 to 90 litres. However, using 70 or 75 litres made very little difference but was a lot more acceptable domestically. This what exactly the type of information I was looking for when I asked what where the initial designs before the marketing guys came in. So, if the B300 was designed for an 80-90 ltre enclosure, then I will make one of that size. Thanks again very much, you have no idea how I appreciate the input. It is a great honor to discuss with you. Now, I wonder just how that correction circuitry in the 105 II is sonically tied into the crossover design? As Lee's 105 heads have had the protection boards removed, could he expect the same sonic results if using an original 105 crossover without that circuit in place and wiring the B-110 / T-52 directly to the main crossover board? Not sure what you mean by "sonically tied". The protection circuit is related to to the thermal characteristics of the voice coils. It is an analogue model of the three vc thermal time constants. The trip point is reached if any of the units gets too large a voltage for too long a period. This corresponds to the voice coil maximim safe operating temperature being reached. The protection circuit has no effect on the crossover filters or eq. I could / should have worded that question better but you have answered it perfectly Speakerguru. That's what I wondered about .. if the mid and HF signal from the main crossover has further EQ or filtering applied in the protection circuit. The reason I ask is that in experimenting with replacing capacitors on a 105 II filter using Solen's / Bennic's I found the tonal character drastically altered. This was surprising, as the same treatment to 2 pairs Cantata's has yielded superb results. Same B-110 / T-52. I suspected interaction with protection circuit was to account for the difference. Well Sasi, if you have more B-139 SP 1044's than you'll ever need, and would like to see 2 of them go to very good use feel free to IM me to discuss. Plan: B-139's in a TL cabinet with B-110 sp1057 & T-52 sp1072 in separate head enclosures ala R105. Cantata crossover. Get the line right and I think it's a winner design. (Sorry, don't mean to offend any contributors here). All other bits are collected, tested, and ready. 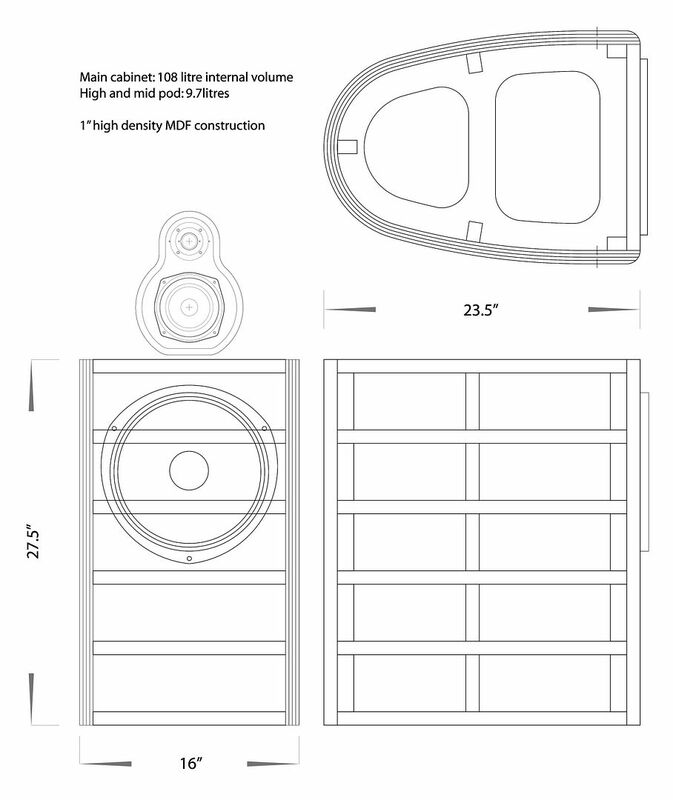 If you make a TL speaker, most likely, it will be about 1.5m tall. In this case, if you put some 105/2 style heads on top of them, then you'll need to grab a scaffold to seat on to be at the heads' height. I am not kidding. Most likely (and that is what I did back then) you will locate the B139 on top, and the mid/hi drivers below.